Another bad design decision ? Looks like it is out of beta... I just got it today - Version 7.5.2 - and agree it is really distracting. I get the viral incentive for EverNote to push us to share notes - but I pay for this service and that should be enough. The only thing they are going to succeed in doing is pushing people off the platform. You can customize that toolbar in Windows, not so on the Mac? No, it's not customizable on Mac. Please bring back the old toolbar to save us from wasted clicks. Or at least tuck this into the [...] menu where it belongs. Another 'feature' nobody requested. Now Im stuck with this button I never ever use. Must be this constant 'Business' pressure from EN. Totally agree. Change for the sake of change is what companies do when they give up on real product development. Just bad design. Ugly. The change would be a whole lot less annoying if they hadn't deleted the Reminder button (alarm clock) and replaced it with the Share button. I use Reminders daily; i use Share never. Now i have to go into the "..." menu to set a reminder. The buttons should be reversed. Instead of tinkering with their logo (which was the only change I could even notice in their 'big' summer update) and redesigning buttons, they should do substantive things, like making the program work in a more intuitive and consistent way between devices and across platforms. Or make Conflicting changes notifications easier to understand. Do they read these suggestions? Agreed - this is completely distracting. And it doesn't help that it's not even a well designed button! You can customise the toolbar on the Mac, but that button is conveniently not part of the toolbar. 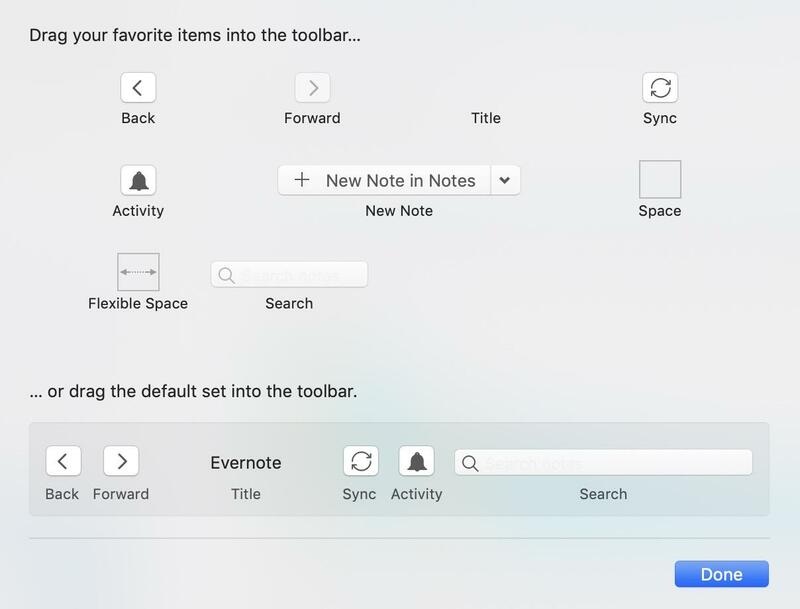 The 'toolbar', which can be customised, only contains a few things like sync status, alarms and a redundant additional button to create a new note. I can't believe someone thought this obnoxious green 'share' button was a good idea, and then doubled down by putting it somewhere that it can't be hidden or removed. It's one thing to have bad taste (taste is subjective, after all); it's another thing to force it on your customers. 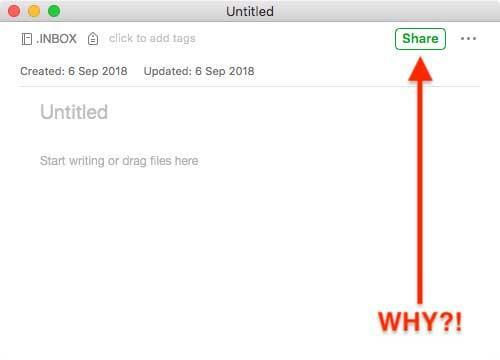 Do they really think that people are suddenly going to start sharing their notes because this ugly green 'Share' button appeared? All that time and work redesigning the logo to make it look like a modern software application, and they throw it all away by reintroducing something which looks like it escaped from Windows Vista. Does anyone any idea on how to delete this share button and get back direct access to the remniders & such ? Who invented this ??? the same way on the android app, we had a great intuitive timer/schedule access (2015 version) and then it was deleted to put in place something basic and not user friendly, it seems good ideas do not everlast here. I also don't want to see that annoying share button. I never use sharing feature.